Welcome! The lobby of the Deranged L.A. Crimes theater is open. Grab a bucket of popcorn, some Milk Duds and a Coke and find a seat. 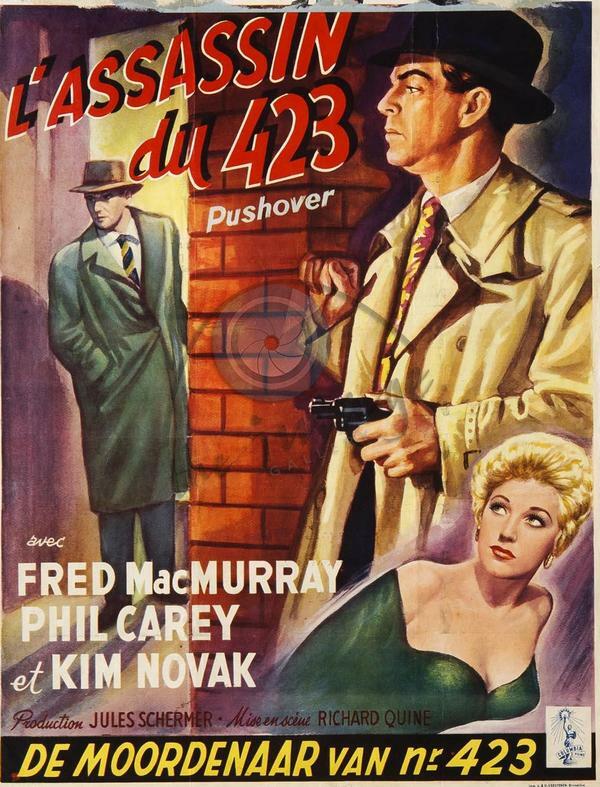 Today’s feature is PUSHOVER , starring Fred MacMurray, Phil Carey, and Kim Novak. A carefully planned bank heist by hoodlum Harry Wheeler and his partner leaves a policeman dead and $200,000 stolen. After the police investigation, headed by Lt. Carl Ekstrom, identifies Wheeler as the culprit, Eckstrom assigns detective Paul Sheridan to befriend Wheeler’s girl friend, Lona McLane, who has moved into an apartment in town. Paul stages a meeting with Lona and a powerful attraction develops between the two. Paul takes Lona to his apartment for the night, then spends the next several days with her. Welcome! The lobby of the Deranged L.A. Crimes theater is open. Grab a bucket of popcorn, some Milk Duds and a Coke and find a seat. 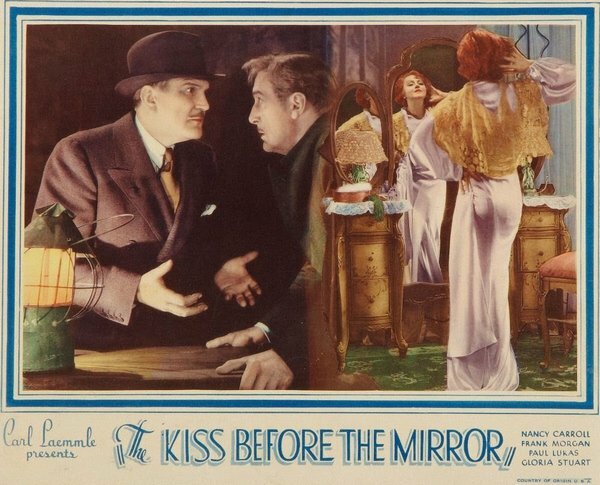 Tonight’s feature is The Kiss Before the Mirror starring Gloria Stuart (you may recall her as Rose, the old woman in the movie TITANIC), Nancy Carroll, Paul Lukas. Frank Morgan and Walter Pidgeon. This pre-code mystery was directed by James Whale. Some of his other films include Frankenstein, The Old Dark House and The Invisible Man. Paul Held, a noted attorney in Vienna, defends his best friend, Walter Bernsdorf, who is on trial for the murder of his wife Lucy. After hearing Walter’s impassioned description of Lucy’s infidelity and the events leading up to the murder, Paul returns home to his wife Maria. While she puts on her make-up in front of her vanity mirror, Paul recognizes a similarity to the events Walter had described in court, and notices that his wife appears to pay special attention to her make-up for reasons unconnected with her love for him. Paul kisses Maria, and she angrily repulses him, claiming he has ruined her make-up; then she casually goes out. Like Walter before him, Paul follows her and watches as she meets clandestinely with her lover.